Starring Julianne Moore, Kristen Stewart, Alec Baldwin, Kate Bosworth, Hunter Parrish, Victoria Cartagena, Erin Drake, Shane McRae, Stephen Kunken, Seth Gilliam, Erin Darke, Daniel Gerroll, Orlagh Cassidy, Quincy Tyler Bernstine, Maxine Prescott, Rosa Arredondo, Caleb Freundlich and Charlotte Robson. Screenplay by Richard Glatzer and Wash Westmoreland. Distributed by Sony Pictures Classics. 99 minutes. Rated PG-13. Alzheimer’s is a tragic, relentless disease that slowly robs its victim of their memory, their mind, their knowledge, their past, their future. Physically they may appear to be still vital, but mentally they are receding slowly but surely until there is almost nothing left. It is a particularly horrific experience because the disease does allow the patient to know what is happening to them and at the same time be powerless to stop the slow, steady disintegration of everything that they knew. Unlike so many other diseases that ravage the body but leave the mind sharp, Alzheimer’s is a gradual and eventually complete breakdown of the mind. 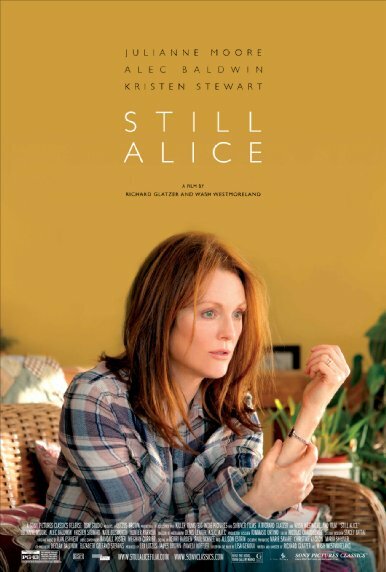 Still Alice, which is based on the best-selling novel by Lisa Genova, takes a smart, clinical, not-overly sentimental look at a Columbia linguistics professor who is diagnosed with a particularly devastating variation of early onset Alzheimers. We get an intimate look at how it affects her life, her marriage, her job, her relationship with her children, her self-esteem and eventually her independence. It features quite probably the best acting job ever by Julianne Moore in the title role – and that is setting the bar very high, because she is quite simply one of our finest actresses. You may as well sit back and place your bets for Moore to collect her Best Actress Oscar, because if it were not to happen then I would be shocked. And this is in a very fine year of female roles. But what Moore achieves here is simply head and shoulders above anyone else. It is particularly tragic because for Alice Howland, language is her life. A well-respected professor of linguistics at Columbia University, she lives a comfortable and rewarding life. Her husband John (Alec Baldwin) is also a professor at the University med school. They have three adult children: Anna (Kate Bosworth), a married lawyer; Tom (Hunter Parrish), who is graduating med school and well on his way to becoming a doctor; and Lydia (Kristen Stewart), the arty one who has moved to LA to try to become an actress. We meet the family as Alice is celebrating her 50th birthday with her family (except for Lydia, who couldn’t make it back east). They look like the picture of success and the perfect family. None of them realize how tragedy is barreling in on them. The first signs that something is wrong are small. Alice loses track of where she is in the middle of a big speech in Los Angeles. She starts forgetting appointments and periodically has to grasp for words. Soon, however, when she is in the middle of the same job that she has done every day and suddenly has no idea where she is, Alice realizes that there is something wrong. She goes to a neurologist, fearing a brain tumor. The tests show a diagnosis even more difficult for the intellectual Alice. She has a rare form of early onset Alzheimer’s disease. Despite the fact that she is much younger than most victims of the disease, it has already taken hold. In fact, the fact that she is such an intellectual may have masked the earlier signs, because a smarter brain often finds ways to cover for the condition. Making it even more devastating is the fact that she has a rare hereditary type of the disease. Her children have a 50%-50% chance to also have Alzheimer’s. The rest of the film takes a look at how Alice has to deal with her life becoming smaller and smaller, and how her friends and family react to the changes in her. Her bosses at Columbia pledge their support but quickly let her go. John tries his best to be there for her, but the constant care for his formerly vibrant wife is wearing on him. Anna finds it hard to deal with her own eventual decline. In fact, it is the most independent one, Lydia, who comes up big for her mother. This could all be played with disease of the week schmaltz, but while there are many devastating moments in Still Alice, for the most part they play it pretty straight. They follow the lead of Moore, who does not make a false move throughout, and who can convey more with her eyes than many actresses can with a page of dialogue. Moore brings out the best in her co-stars, particularly Stewart, who is a revelation as the daughter who has the rockiest relationship with Alice, but who comes up big for her mother when it is needed. Copyright ©2015 PopEntertainment.com. All rights reserved. Posted: January 16, 2015. Tags: Alec Baldwin, Alzheimer's Disease, best actress, Caleb Freundlich, Charlotte Robson, Daniel Gerroll, Erin Darke, Erin Drake, Hunter Parrish, jay s jacobs, Julianne Moore, kate bosworth, Kristen Stewart, Lisa Genova, Maxine Prescott, movie review, Orlagh Cassidy, oscar nominee, PopEntertainment.com, Quincy Tyler Bernstine, Richard Glatzer, Rosa Arredondo, Seth Gilliam, Shane McRae, Stephen Kunken, Still Alice, Victoria Cartagena, Wash Westmoreland. Bookmark the permalink.